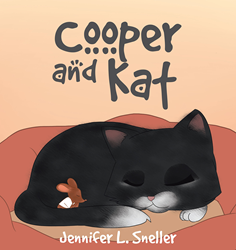 Jennifer L. Sneller’s newly released “Cooper and Kat” is a heartwarming children’s picture book about love’s power to transcend outward appearances and differences. “Cooper and Kat” from Christian Faith Publishing author Jennifer L. Sneller is an adorable children’s rhyming picture book about two unlikely friends, a cat and a rat, with a profound message—that the love that sustains friendships comes from within, where one is made equal in the sight of God, and so outward appearances and differences hardly matter at all to the One who created everything. “Cooper and Kat”: a beautiful book about what a cat and rat’s unlikely friendship can teach about God’s true love. “Cooper and Kat” is the creation of published author Jennifer L. Sneller, a longtime poet and military wife who lives with her husband and their three children in Virginia Beach, Virginia. Sneller writes about her adorable duo, “Cooper was a kind and caring rat, who spent the day with his friend Kat. Kat and Cooper were a sight to see, about as different as two could be. One was big, the other was small. Kat lived in a house and Cooper the wall. Kat’s fur was soft and silky, mostly black and a little bit milky. Cooper was brown and rather stout, with crazy fur that all stuck out. Published by Christian Faith Publishing, Jennifer L. Sneller’s new book is an important discussion starter for parents of little children who are just beginning to learn how to make friends and come to terms with interpersonal differences like race, nationality, gender, religion, or economic background. Rooted in the undiscriminating love of Christ, the friendship of Cooper and Kat is a memorable way for children to grow up more godly and compassionate. View a synopsis of “Cooper and Kat” on YouTube. Consumers can purchase “Cooper and Kat” at traditional brick & mortar bookstores, or online at Amazon.com, Apple iTunes store, or Barnes and Noble. For additional information or inquiries about “Cooper and Kat”, contact the Christian Faith Publishing media department at 866-554-0919.